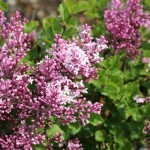 A small compact, rounded shrub with fragrant, lavender-pink flowers on 4" long panicles in the spring. It is a very heavy bloomer. If cut back after flowering, it can be kept fairly small, which also improves next season's blooming. Grow in full sun, in an average, well-drained soil. Makes a great low hedge, use as a specimen, or in mass plantings.